HP's consumer Pavilion range has often impressed us with its stunning designs, sturdy build quality and great usability. The Compaq Presario CQ60-313SA aims to provide a similar quality at a lower price, and does so in style, despite minor shortcomings. While the 169-minute battery life isn't huge, it suits basic travel use. The 3kg weight isn't the lightest, but is comfortable to carry on short journeys. The slim and curved chassis is well built, but the glossy lid attracts scratches and scuffs. The wide keyboard and recessed touchpad provide great usability. All the keys move with a smooth action, but rattle slightly when typing quickly. A pad of numeric keys is also in place for inputting data quickly into spreadsheets. The most unique feature is the 15.6-inch widescreen panel. Its 16:9 aspect ratio is ideal for watching movies, as it eliminates the black borders often seen at the top and bottom of the screen. Colour and contrast are strong, but the screen's low brightness lets it down slightly. HDMI and VGA ports let you connect to high-deﬁnition (HD) and analogue screens for a bigger picture. It's a sign of the times that such affordable laptops can sport cutting-edge HD outputs. That said, the HP is ﬂawed by poor performance. The dual-core AMD processor and 3072MB of memory provide ample power for basic home use, but it is outperformed by most similar laptops when it comes to complex multi-tasking, so consider your needs. In contrast, 3D performance is excellent. This is one of the few laptops at this price to use a dedicated GPU, rather than an integrated Intel chip. It makes it a great choice for home photo and video editing, and even lets you enjoy basic gaming. The LightScribe-compatible DVD rewriter adds extra multimedia usability. As well as standard CD and DVD read/write access, it lets you burn custom designed labels to compatible discs, providing an easy and stylish way to catalogue your collection. Basic storage is provided by the 160GB hard drive. Although not particularly large, it provides enough space for a family's ﬁles, but isn't ideal for huge collections of music, photos and videos. A 5-in-1 media card reader also lets you access ﬁles from your digital camera. Finally, an impressive package of software is included, with tools for home ofﬁce use, DVD creation and internet security. 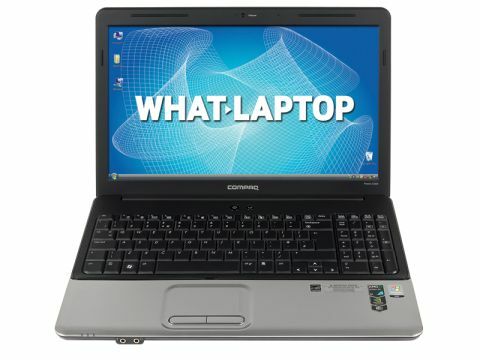 Despite its ﬂaws, the Compaq Presario CQ60-313SA is an excellent laptop with plenty to recommend it. Just bear the limited performance in mind.